Video files (as well as audio files) can be coded in the same way as texts in MAXQDA. To do so, open the video file in the Multimedia Browser as described in the section above. To roughly mark a segment, keep the left mouse button pressed and select the segment by dragging the cursor over the waveform. The time limits are displayed underneath the beginning and end marks. You can easily alter the time limits of the clip by moving the whole blue-marked segment or by clicking and dragging the outer borders of the segment in the waveform. By using the right and left arrow keys, playback is moved by one-tenth of a second. If the playback precisely matches the beginning or end of a clip, the clip is enlarged or reduced accordingly. To play the marked clip, click the icon Play clip or press the F9 key. Press the button Play/Pause or the F4 key. When the playhead is at the designated position, click the button Set clip start or press the F9 key. If necessary, use the arrow keys on the keyboard or by clicking and dragging the clip borders to fine-tune the start of the clip. Resume playback and pause at the position where you want to end the coding. Click the button Set clip end or press the F10 key. If necessary, make a fine-adjust the clip. Place the playback position at the beginning of the passage. Use the scroll bar to scroll to the approximate end of the passage. Then click the waveform while holding down the Ctrl key (Windows) or cmd key (Mac). MAXQDA will then mark the entire area between the two positions. The clip boundaries can be adjusted as usual with the small sliders. When coding is completed, it will be indicated by a horizontal coding stripe in the Multimedia Browser. Below it, on the left, the code name is displayed. The coding will also be indicated by the color of the waveform (green for standard codes, other colors for color codes). If various codes are layered on top of each other, the color of the waveform is a mix of the colors. 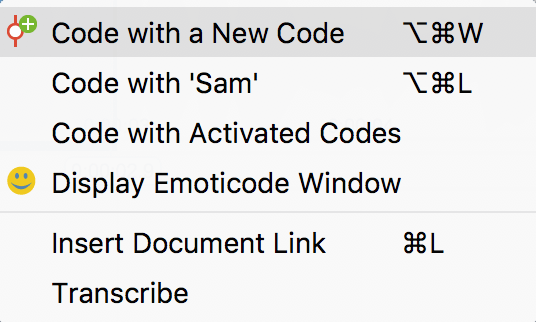 Segments coded with an emoticode are indicated by the Emoticon next to the coding stripe. Clicking on a coding stripe selects the coded segment on the waveform. Double-clicking plays the clip. Coded segments that have a comment are marked with a white square on the left-hand side of the coding stripe.